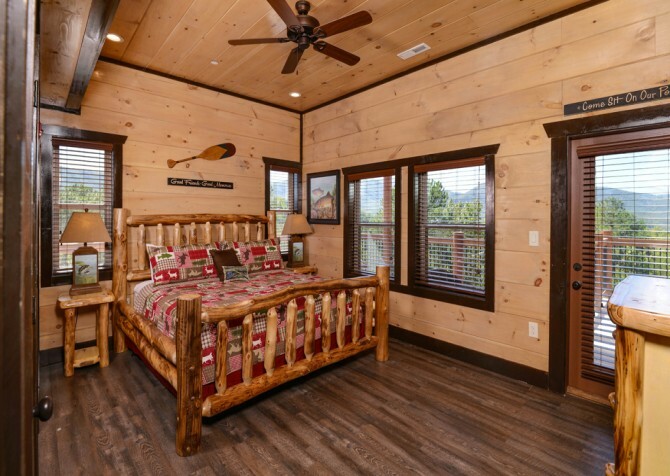 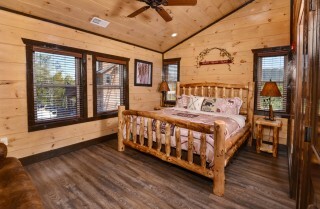 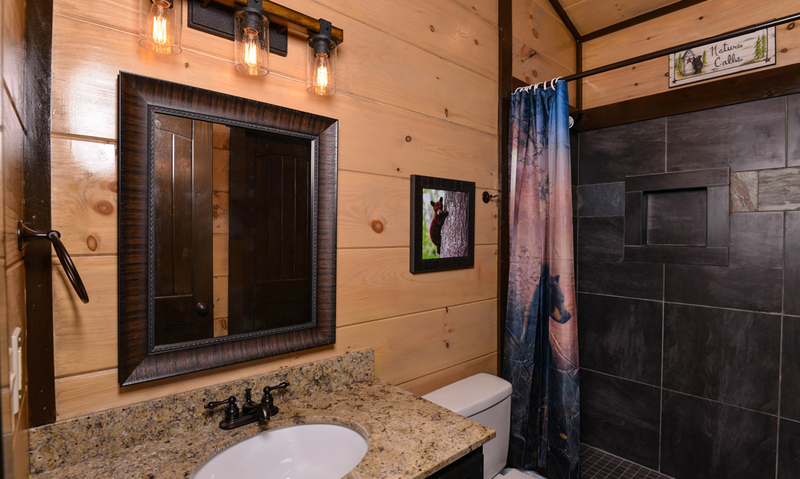 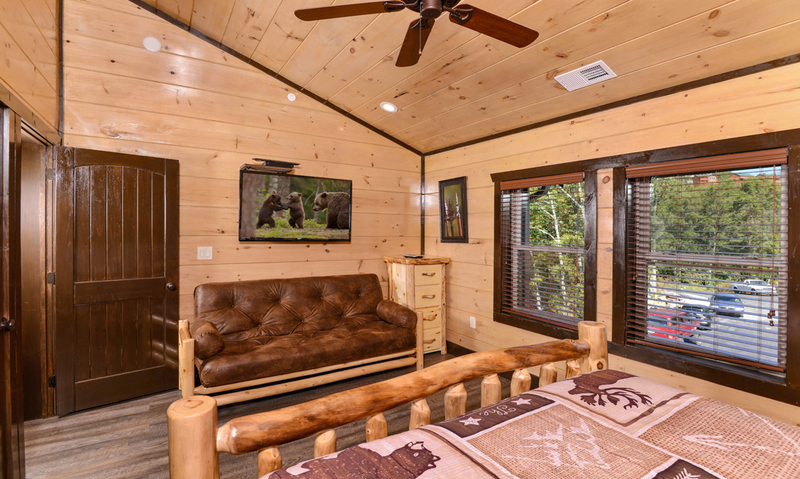 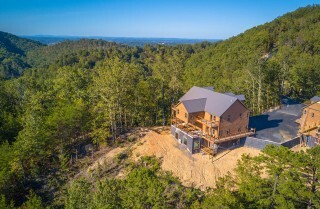 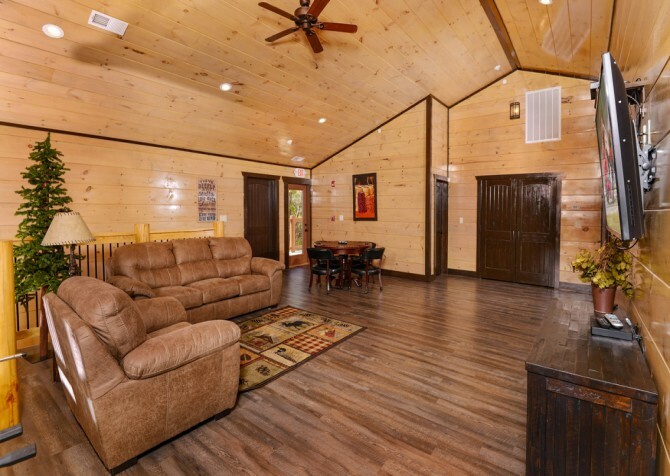 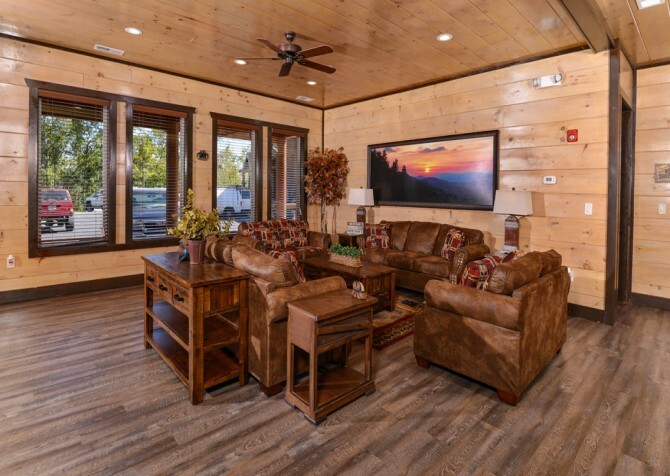 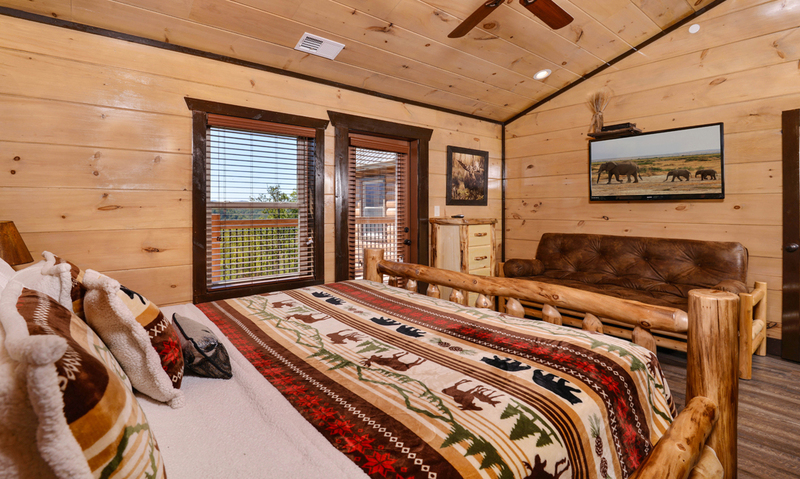 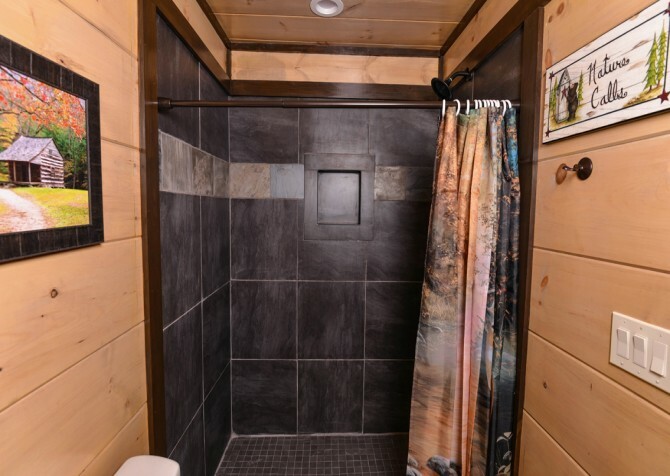 A Pigeon Forge cabin truly befitting its name, this group stunner in The Village at Sherwood Forest is luxury all around, with a perfectly incorporated lodge feel throughout. 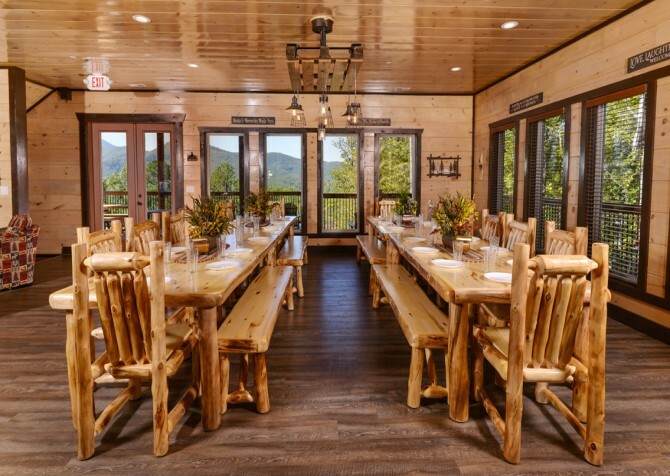 A wedding party, a business retreat, a family reunion — large groups deserve a luxurious stay in the Smoky Mountains, too! 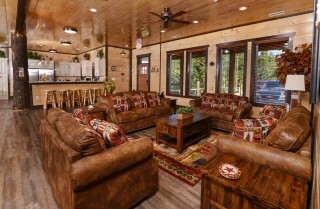 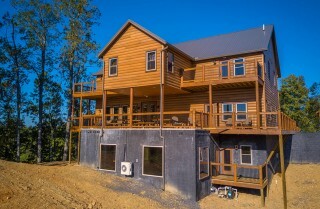 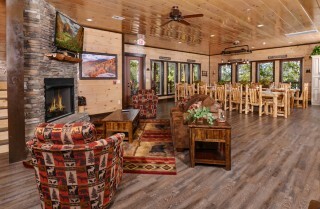 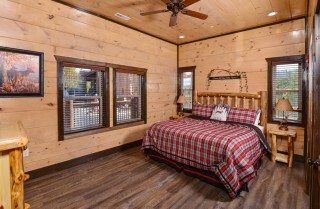 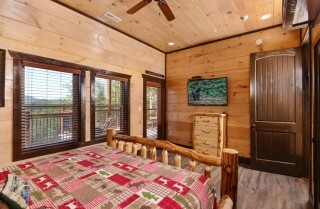 With this in mind, Luxury Lodge was created with a large, fully equipped kitchen – with double appliances – a spacious dining area with plenty of seating, multiple rec areas to keep everyone entertained, 12 cozy bedrooms, 12 full bathrooms (plus 2 half baths), and 10 king-size beds mixed with bunk beds, futons, and sleepers. Throw a game tournament upstairs, a pool party downstairs, a barbecue outside, and a movie night inside — the private theater! 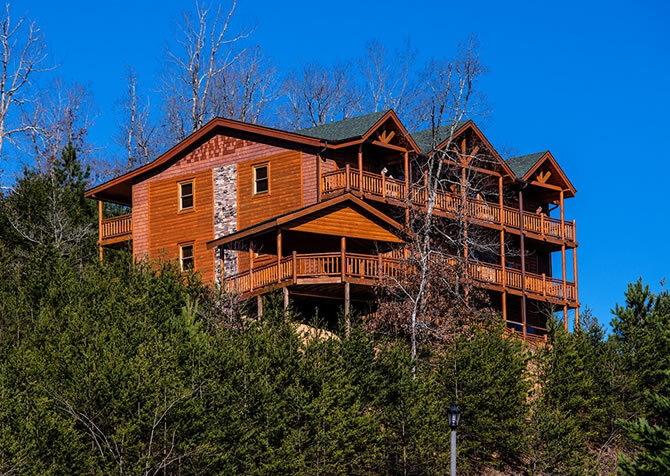 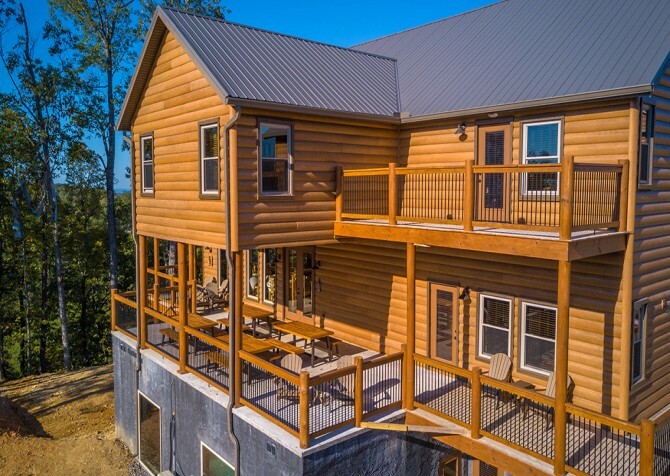 On top of all the luxurious perks at the cabin, Luxury Lodge boasts easy access – a less-than-5-mile drive – to downtown Pigeon Forge. 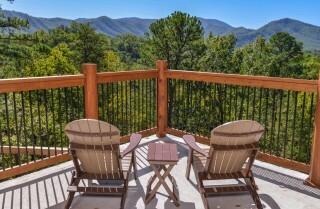 Downtown Gatlinburg is within 10 miles, so that means double the restaurants, attractions, and shops. 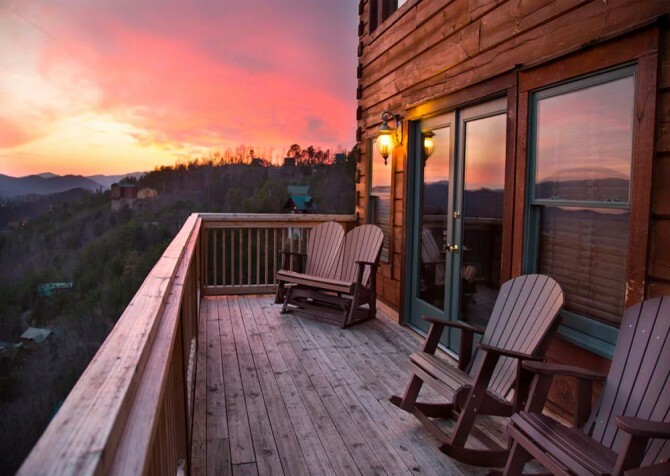 If you can pry the group out of this gorgeous getaway, you’ll find plenty to keep everyone happy in town. 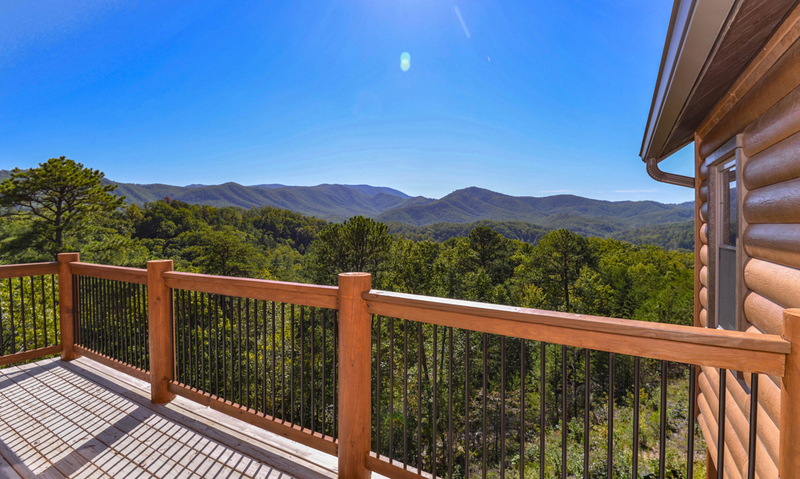 Miniature golf, go karts, laser tag, arcades, wineries and distilleries, live music, BBQ, steakhouses, Dollywood, The Island, Ober Gatlinburg, the Great Smoky Arts & Crafts Community, the Great Smoky Mountains National Park…the list goes on and on. 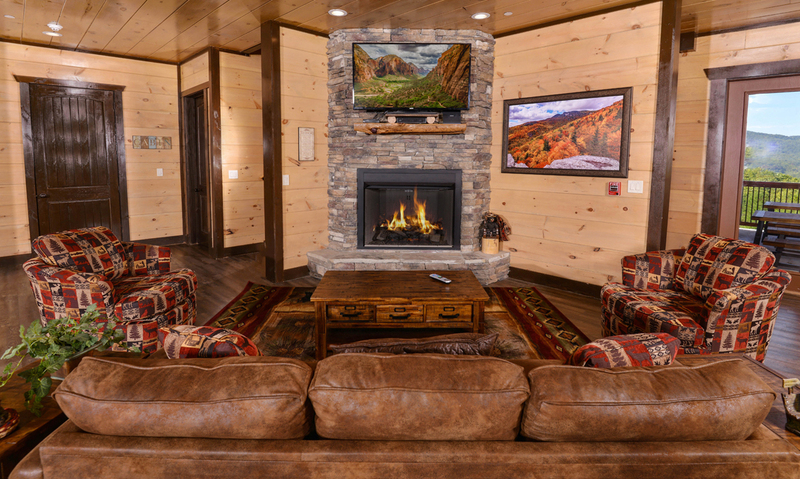 With 2 sitting areas in the living room, one group can have the space with the flatscreen TV and gas fireplace while another group chitchats in the sofa lounge. Featuring 3 couches, 2 loveseats, 2 arm chairs, 2 ceiling fans, and multiple tables, this living room is great for sipping your morning coffee while reading a devotional, letting the kids play on the large area rug while you watch the big game, checking on news via the high-speed wireless internet, or telling ghost stories by the crackling fire while watching the eyes of your listeners widen with intrigue. 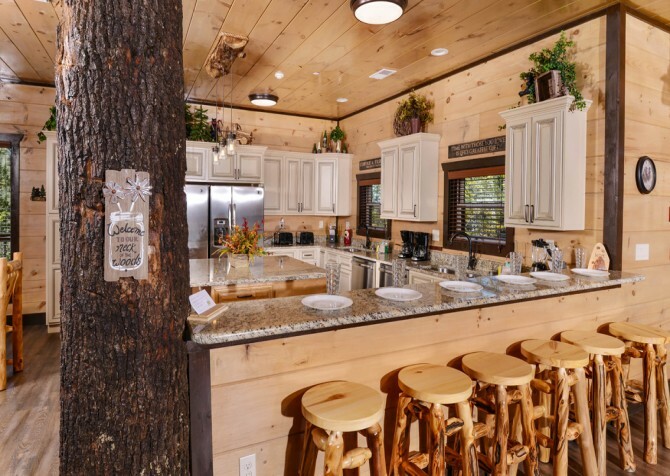 Stepping into the home, you’ll find the deluxe kitchen to the right, which features a bar area with 6 stools, modern stainless-steel appliances, a large island in the middle, and a tree trunk as a support beam. Utilize the 2 refrigerators to keep the leftovers from downtown safe, the 2 electric ranges to bake the best chocolate-chip cookies, the 2 coffeemakers to get everyone off on the right foot in the morning, the 2 toasters to appease morning-bagel madness, the 2 double sinks to wash all the vegetables, and the 2 dishwashers to take care of the dirty work! There’s even a handy blender for the health-conscience juicers, and don’t forget the mountain views streaming in from the back windows! 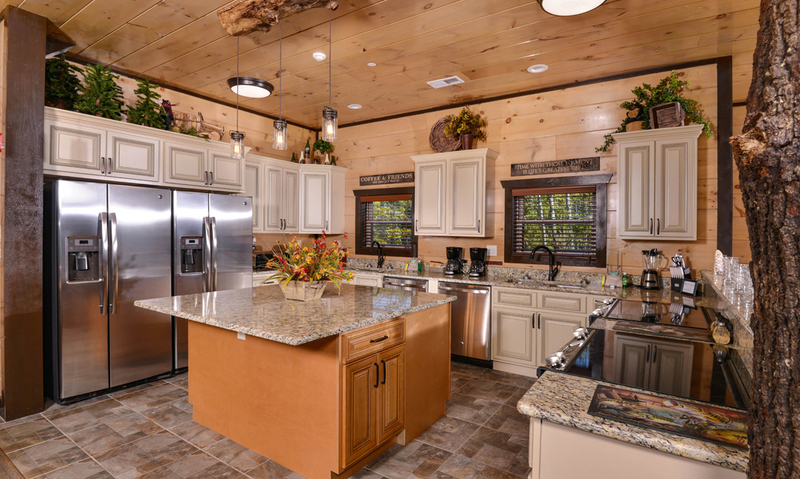 Whether you’re here for the holidays or just need to feed an army, you’ll find the space and high-end tools you need here! 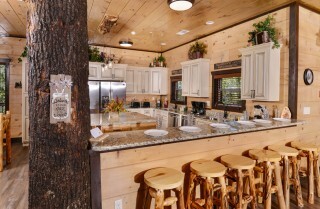 An open floor plan places the dining area just off the kitchen, making it easy to serve up a big meal. 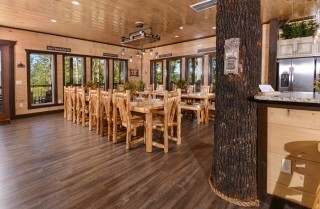 With 4 sizeable wooden tables accompanied by 16 chairs and 4 benches, 28 guests can dine comfortably indoors (34 counting the bar area in the kitchen). 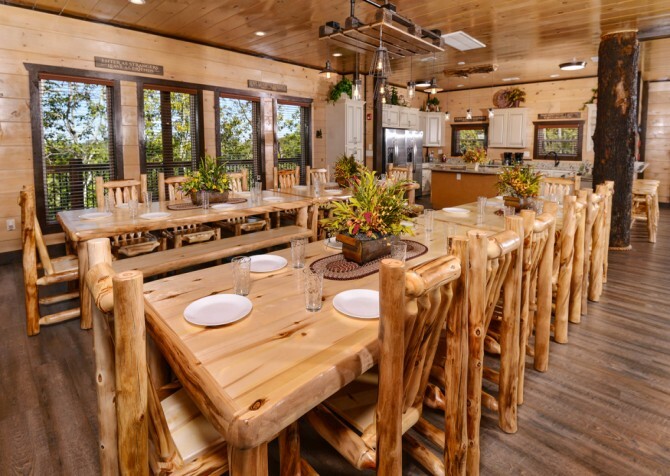 Accessible from the dining area, the entry-level deck — featuring a covered eating area with 4 picnic tables — provides around 20+ more seats outdoors. 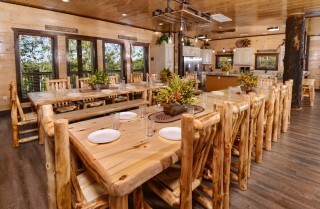 Simply leave the back doors open to keep everyone connected during morning breakfasts, afternoon meals, and evening feasts. 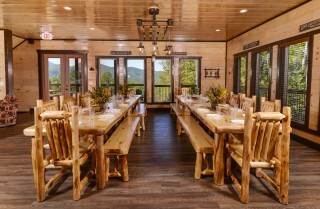 With the Smokies in view, dining here won’t merely be a time to eat but also a time to take in the beautiful sights! With 2 rec areas in the home, entertaining everyone, from kids to adults, will be a breeze. One group can head to the second floor to play poker on the poker table (chips included! 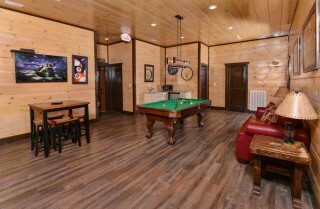 ), watch the latest episode of your favorite shows on the big screen TV, or wage war on the foosball table. The ceiling fan will keep everybody cool, the couch (also a queen sleeper) and arm chair will provide comfort, and the end table will happily hold the drinks. 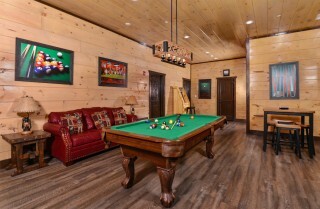 Also, feel free to take some provided games (Yahtzee, Sorry!, Smokies-Opoly, etc.) down to the dining area for a game party! Another group can head to the lower level to duel the arcade unit (with a seat for endless play), cheer for their favorite team on the mounted flatscreen TV, or compete in a few rounds of pool. Plus, there’s a sleeper sofa and a table with 4 stools where guests can chill with a drink or snack from the wet bar — complete with a stainless-steel microwave, sink, and mini fridge. 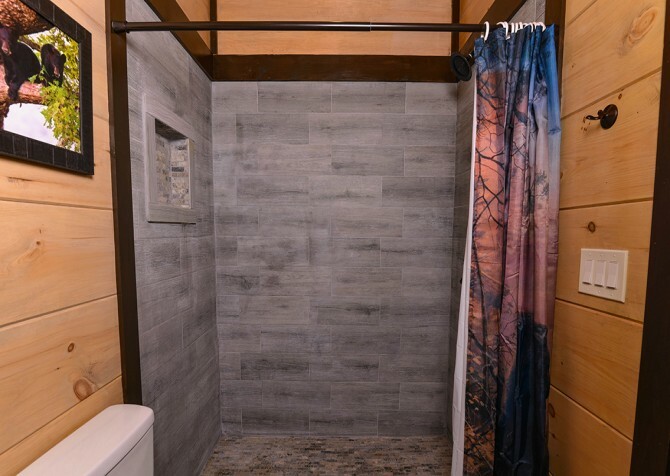 For convenience, there’s also half bath nearby. 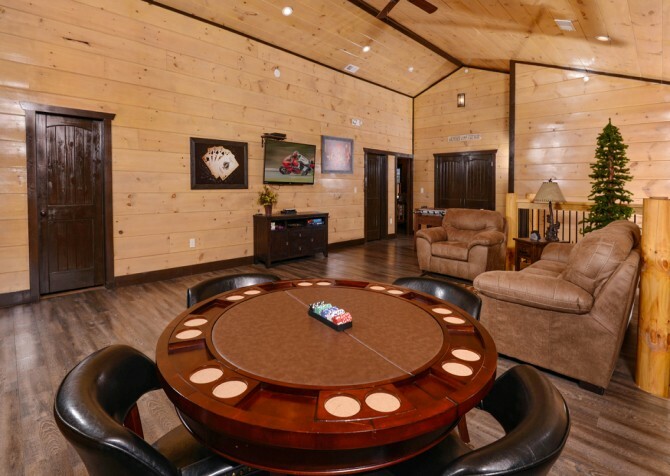 With games to play and people to defeat, boredom won’t be a bother in this home! 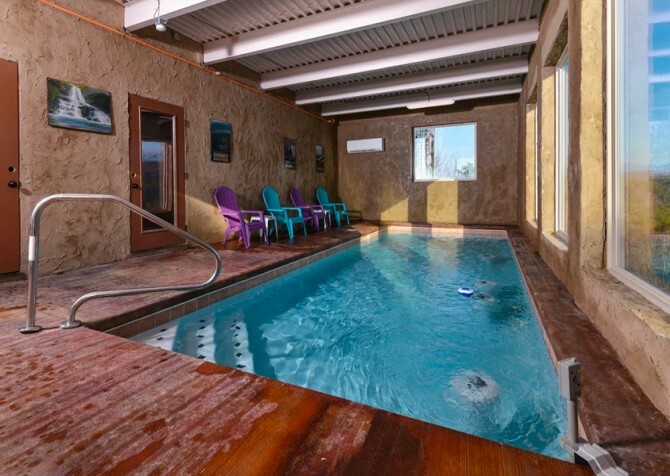 After your victory streak at pool, take a few victory laps in the pool — the private indoor pool, that is! 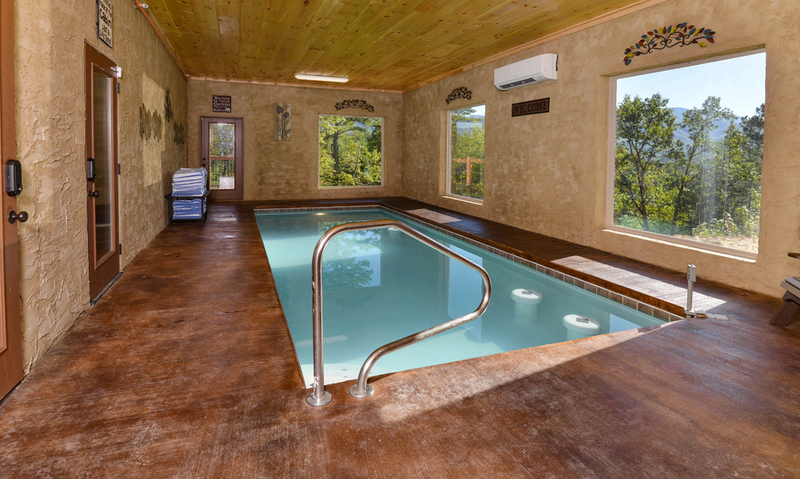 Right off the downstairs rec area, you’ll find the swimming pool room with large windows, treating you to wooded and Smoky Mountain views! 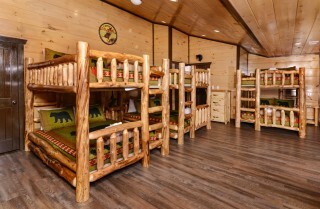 A couple of chairs and a small table make watching the kids more comfortable. 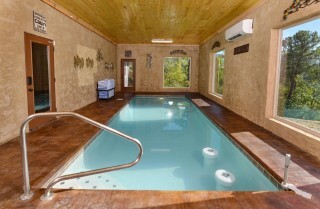 Better yet, keep an eye on them from one of the 4 underwater seats instead! Most importantly, before you enter the pool area, be sure to pay heed to the sign above the door: “Take time for what matters most!” Remember to relax, unwind, let go, be present, and breathe. 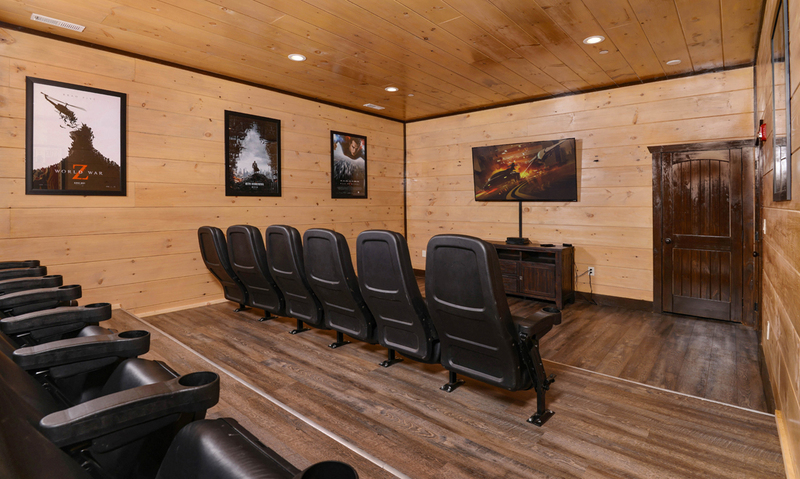 Prepare yourself for epic nights in the theater room with a mounted flatscreen TV! As you enter the room, inspiration will strike from the posters of modern movies and classic films. 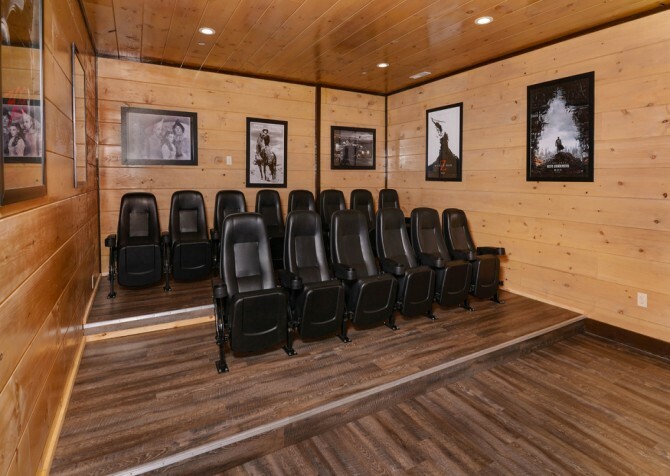 Grab your movie-watching buddies and relax in the 14 theater seats (with drink holders) while weeping to a romance, laughing at a comedy, jumping to a thriller, screaming at a horror film, or getting pumped from an action movie. 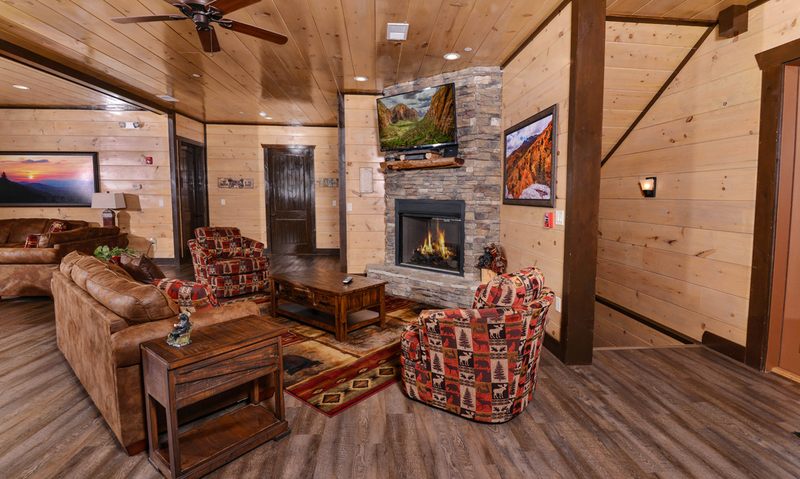 Don’t forget to pop tons of buttery popcorn for everyone in the wet bar’s convenient microwave — you’ll be the star of the show then! Sleeping up to 54 guests, Luxury Lodge provides 12 bedrooms, several with flatscreen TVs, nightstands, and lamps for your convenience. 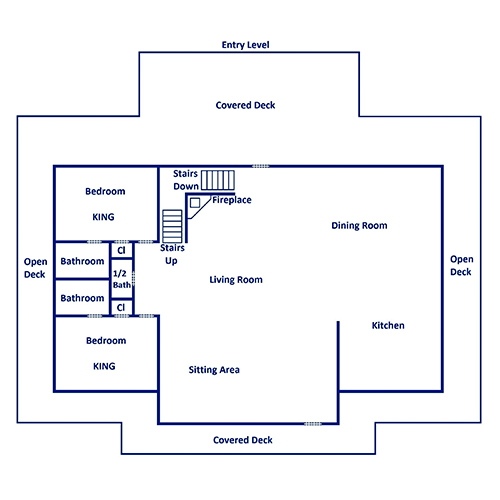 On the entry level, there are 2 bedrooms. 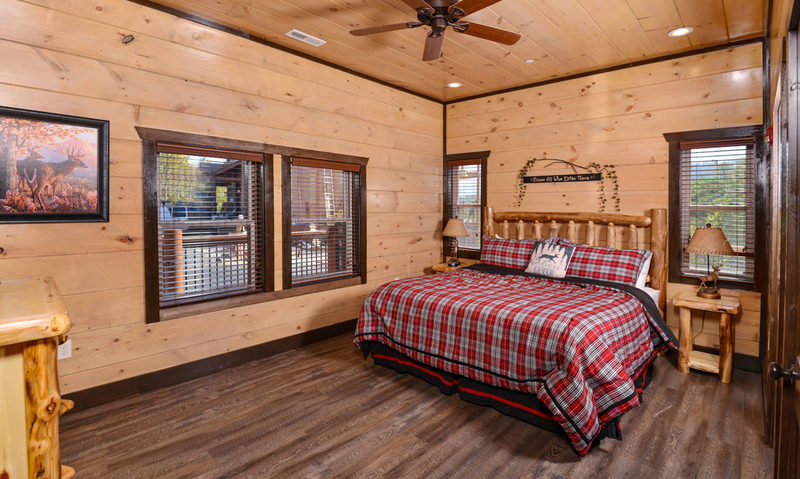 Both harbor a king-size bed and an en-suite bathroom — one even comes equipped with handicap features. 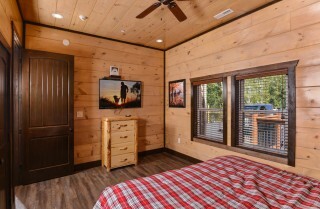 With easy access to the kitchen, these bedrooms keep scrumptious midnight snacks and soothing herbal tea close at hand. 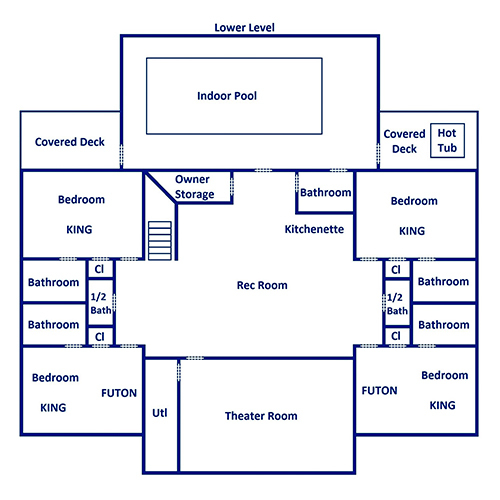 On the second floor, there are 6 bedrooms. A king-size bed can be found in 4 of the bedrooms — each with an en-suite bathroom, 3 with a futon, 2 with access to a communal deck, and 1 with a private deck! The fifth bedroom has 3 queen bunk beds and an en-suite bathroom, and the sixth bedroom has 2 queen bunks. Directly off the upstairs rec area, late-night poker players and foosball enthusiasts will appreciate a room on this floor. 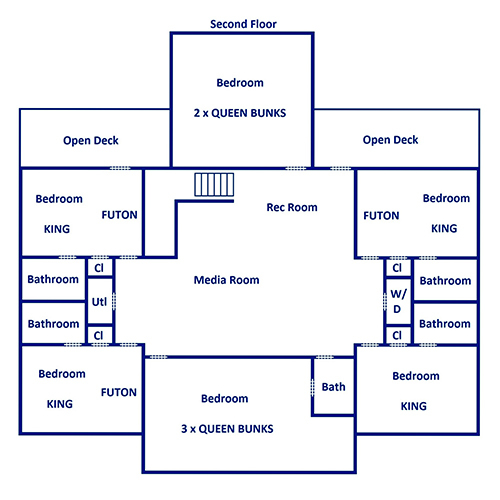 On the lower level, there are 4 bedrooms — each with a king-size bed and an en-suite bathroom, 2 with a futon, and 1 with access to a communal deck. 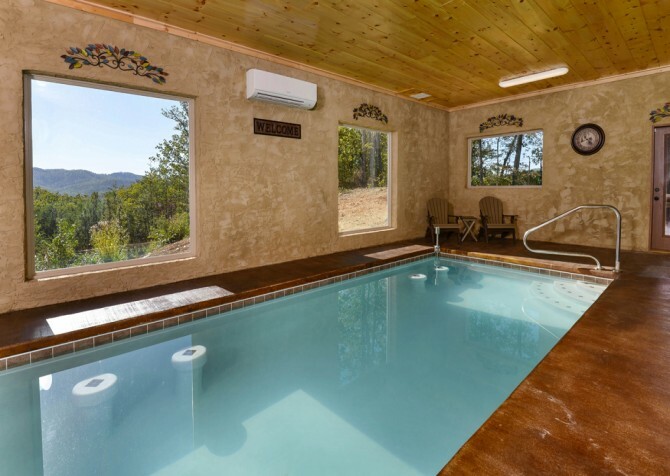 From knocking out first place on the arcade machine and watching a Pixar animation on the flatscreen to sipping champagne by the indoor pool and lounging in the outdoor hot tub nearby, a bedroom on this level might be worth fighting over — rock-paper-scissors style! 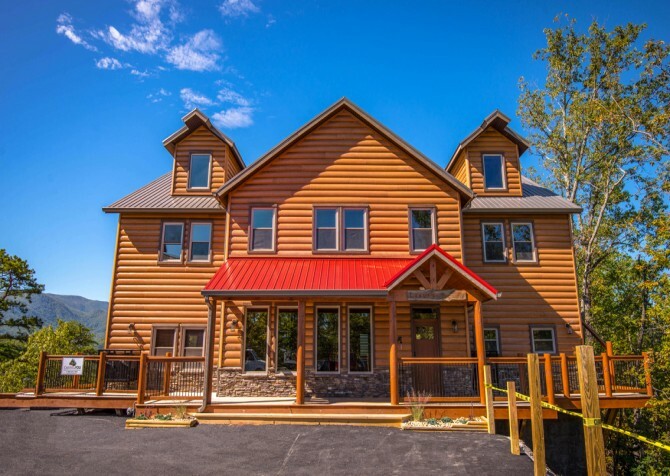 Providing 12 parking spaces on a flat, gravel driveway, Luxury Lodge is more than ready for large groups. 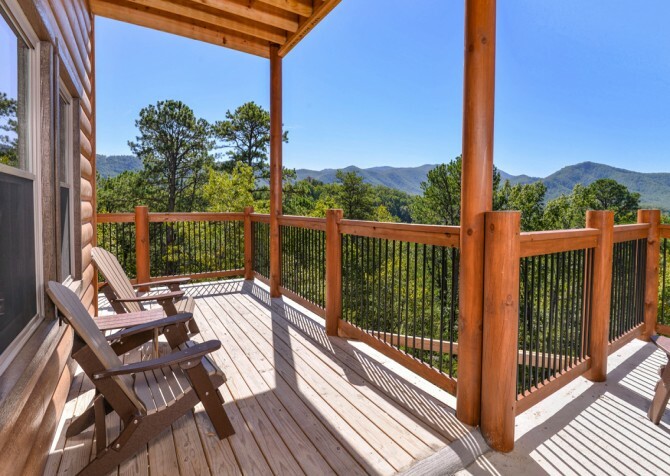 After crossing the spacious front porch, continue through to the entry-level deck for breathtaking views — multiple sets of chairs and tables (including the 4 picnic tables) await! 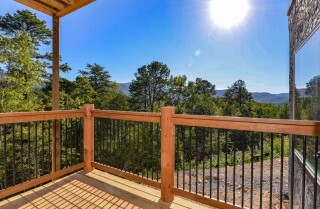 Upstairs, there is a deck off the rec area for everyone to enjoy and a private deck off one of the bedrooms. 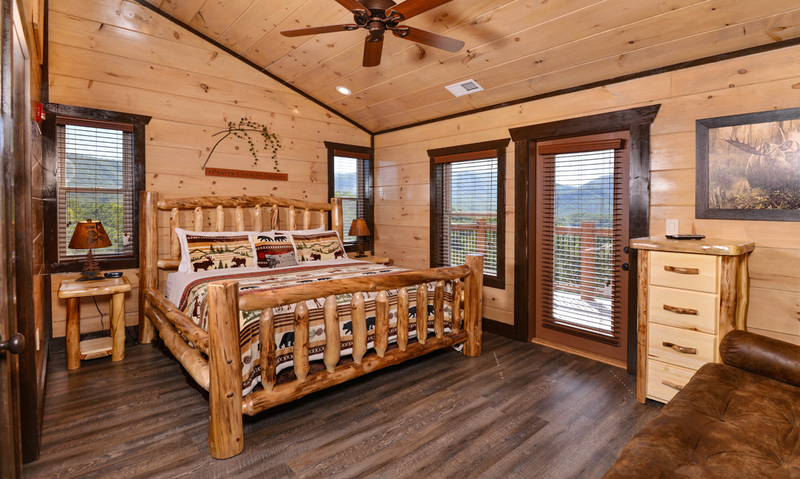 Roll out of bed and soak in the mountainous landscape before you even brush your teeth…if you want. 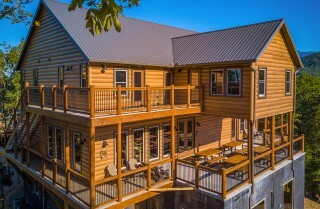 Downstairs, you’ll find the lower-level deck connected to the pool room and one of the bedrooms. 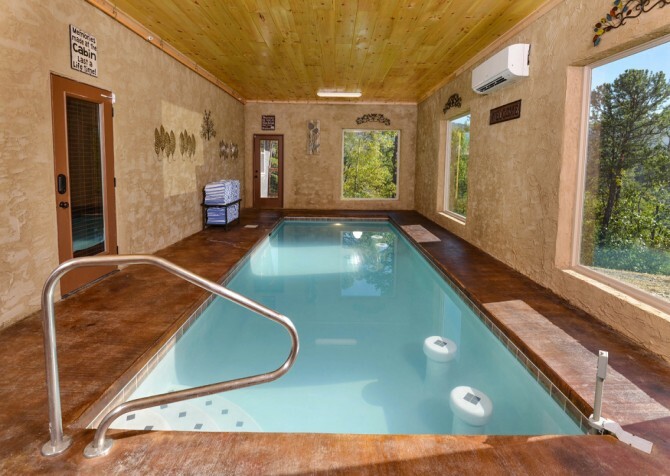 On the other side of the pool room, the outdoor hot tub is ready and waiting to provide relaxation and rejuvenation! 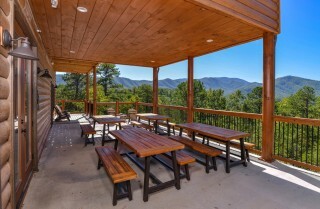 For barbecues on nice nights, enjoy the charcoal grill (picnic style)! 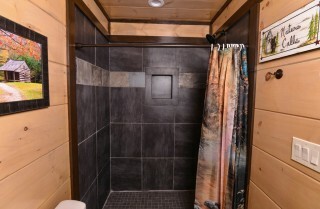 Additionally, a convenient washer and dryer are in the cabin, so you don’t have to bring your own towels (each person gets one bathroom set in addition to a pool towel) or stuff your suitcase with dirty laundry. Along with the private indoor pool, this lodge grants access to the outdoor community pool at Sherwood Forest Resort. Let the kids splash around in the outdoor community pool in the summertime and spend relaxing evenings in the private indoor pool year-round. 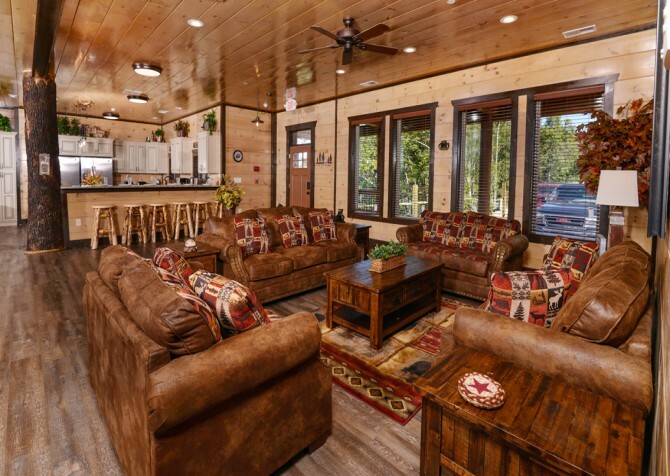 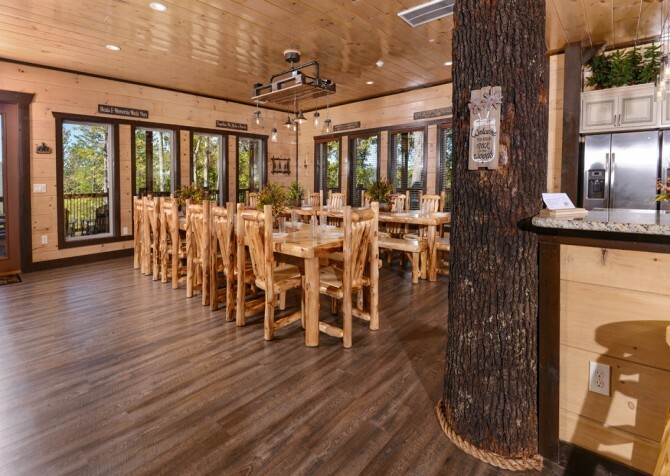 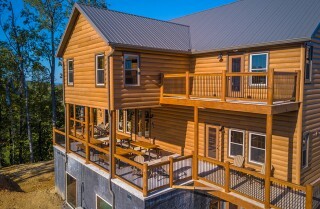 Less than 5 miles to the heart and soul of Pigeon Forge, Luxury Lodge makes it easy to travel into the city for exciting experiences, adventurous tours, and fun-filled outings. It’s time to let loose at TopJump, a trampoline park with a ninja course for the speed demons, a dodgeball area for the athletes, a kid zone for the little ones, an arcade for the big kids, and a climbing course for the daredevils! 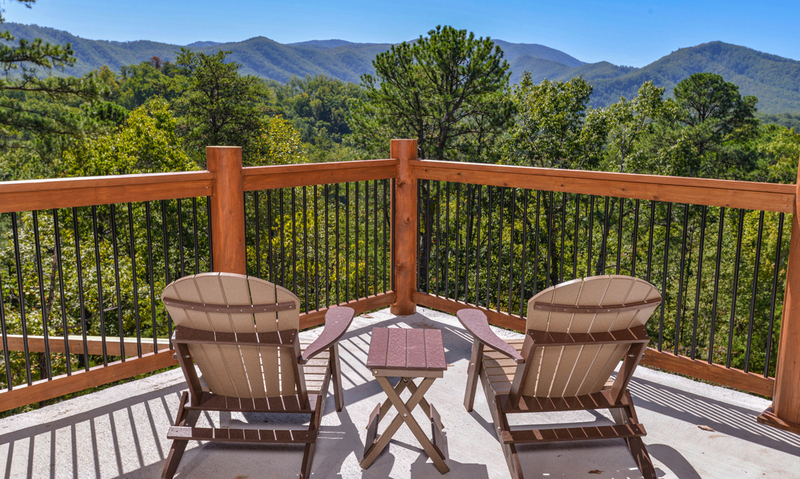 Leave your cares behind as you zip your way through the Great Smoky Mountains — there’s no better way to see them than up close and personal! Ride all the rides, eat all the food, buy all the souvenirs, and watch all the shows at Dollywood, an exhilarating amusement park in the Smokies! Renters must be at least 25 years of age to book this property.